In a nod to my childhood fascination with Halloween and things that go bump in the night, I still reserve the month of October for books about dark subjects. I’ll sample the latest in horror fiction or bury myself in non-fiction accounts of unsolved mysteries or infamous killers. 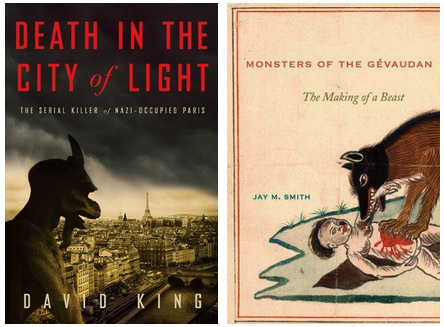 This year, my October selections were two recent works of historical non-fiction: Death in the City of Light: The Serial Killer of Nazi-Occupied Paris by David King and Monsters of the Gévaudan: The Making of a Beast by Jay M. Smith. At a glance, these books might seem to have little in common, other than the fact that they both take place in France. Monsters of Gévaudan, after all, is about the well-documented events that took place in the rugged, rural mountains of south-central France from in the 1760’s, when a mysterious creature – known simply to the French as La Bête – viciously attacked over 200 women and children, killing at least half. Death in the City of Light, on the other hand, takes place in more modern times, telling the story of a mad doctor who used the chaos of the Occupation to murder scores of Parisian Jews and gangsters eager to flee the beleaguered city. But beyond the French connection and the murderous monsters at the center of each book, many more striking similarities exist. The mid-18th Century was a time of great change in France, as were the three years during which Nazis occupied Paris. The pivotal state of flux created on one hand by France’s embarrassing defeat in the Seven Years War and the dawn of the Enlightenment and on the other by Nazi invaders created the perfect milieu for La Bête and Dr. Marcel Petiot. Both achieved disturbingly high body counts during their three-year reigns of terror thanks to monumental change and confusion of their respective eras. In Monsters of Gévaudan, Smith does a commendable job bringing to life the dawn of the French Enlightenment, when the natural sciences made their first tentative forays into the public conscience and the mist of superstition and legend began to be dispersed by man’s natural desire to know. Don’t be fooled by this book's subject matter – it's a scholarly work, heavily footnoted and exhaustively researched. Thus, for anyone new to the phenomenon of La Bête, this is not the place to start. Smith’s ambition is far greater than to simply repeat the heavily documented events that took place between 1764 and 1767. You won’t find terrifying accounts of the beast’s grisly deeds or much speculation about what she actually was, except what exists in the correspondence of the principal characters and the often hilarious coverage in the newspapers of the day. Smith’s book, then, seeks to shed new light on the Gévaudan phenomena by putting it in the context of the time and place it occurred. La Bête claimed her first victim one year after France’s humiliating defeat at the hands of the Prussians in the Seven Years War. The war left France with a dire economy, an unpopular king and a surfeit of national pride. This was also a time of religious upheaval, with the suppression of Protestantism and the abuse of the Huguenots, not to mention the uneasy relationship of the Jesuits to French royalty. Finally, this was the dawn of the age of mass media. Smith devotes many pages describing the characteristics of the competing journals and how their coverage magnified, confused and often shaped the public’s perception of the events occurring in the Gévaudan. Smith describes all these contributing factors succinctly, always focusing his history lessons on the ways in which the events helped shape the mystery in the Gévaudan. The purpose of all this is to give modern readers a better understanding of the events that have mystified and puzzled the French for two and a half centuries, and to once more make it clear that while La Bête may be legendary, she’s no legend. The area now known as the département of Lozère is still dotted with her victims’ graves, and the public archives contain thousands of papers and private correspondence attesting to her existence. She was seen by hundreds of eyewitnesses, and reportedly shot by several different hunters in the company of large groups of observers. Yet she always managed to escape – ever elusive, as all great French ladies. So you’ve got a mysterious wolf-like creature rampaging across the French countryside at a time of religious and social upheaval – a problem so major it even prompted the unusually aloof King Louis XV to take action. His aides called in a series of much-heralded hunters (each, in turn, heralded as “the new Hercules who will rid France of this terrible affliction”) to hunt down and kill the monster. If a more interesting subject than this exists, I’d like to hear about it. And yet, for all its strengths – and there are many – Monsters sometimes has a hard time conveying the excitement. It operates on the assumption that you are intensely familiar with the career of La Bête, and thus refuses to establish a clear timeline of events. Shocking events such as double killings, beheadings of victims by the beast and rumors of unexplainable feats are given short shrift, while the minutia of archaic religious matters are examined in great detail. In the end, Smith’s view on the matter of La Bête is the soberest one possible. He believes an infestation of particularly aggressive and bloodthirsty wolves was responsible for the slaughter. Other explanations run the gamut from escaped hyena, a wolf-large dog hybrid and, of course, the dreaded werewolf. If you’re new to Gévaudan phenomenon, you’d do well to familiarize yourself with the story before reading Smith’s book. But for La Bête fans looking for a more cerebral dissection of those terrible murders that occurred on that desolate stretch of rugged terrain so long ago, Monsters of Gévaudan is a must-read. The killer described in David King’s book is no less monstrous than the mysterious Bête. And since the killing spree of this more recent beast took place during the Occupation, his aren’t the only chilling deeds described in Death in the City of Light. Despite its gruesome subject matter, Death is an entertaining, gripping trip back to the darkest days of French history. While the Nazis were busy turning Paris into their personal Gomorrah, using its famous brothels and cafés to distract themselves from the gruesome battles of the Eastern Front, Marcel Petiot – doctor, politician, con man and serial killer – was using the city to fulfill his seemingly unquenchable thirst for blood. Death traces Petiot back to his early days, describing a medical, political and romantic career that left behind a trail of mysterious deaths and unanswered questions. Death in the City of Light has been frequently compared to the modern masterpiece of true-crime, Devil in the White City. I wouldn’t go quite that far, but it is quite good. That comparison is natural because the similarities between the killers these books describe are uncanny. Dr. Petiot and H. H. Holmes were charismatic con artists able to talk their way out of trouble. They were both devoid of morals and eminently willing to use murder for personal enrichment. Most strikingly, both of these serial killers operated out of mysterious houses of horror. Holmes built his “Murder Castle” in the 1880’s in what is now South Side Chicago, installing a bizarre assortment of rooms without doors, complete with dead end stairways and the always handy corpse-hatch. Petiot bought his property on rue Le Sueur and made alterations later. Both houses contained basements with exam tables, powerful stoves (which were found overflowing with human bones) and lime pits that would’ve been the final resting spot of hundreds of victims had they not been found out. Since David King points out how voraciously Dr. Petiot consumed books about crime, it’s a little surprising that he never once mentions H. H. Holmes, who certainly could’ve conspired Petiot’s heinous career. Early on in his medical career, Petiot faced jail time for being too liberal with the prescribing pen (not, it turns out, for the suspicious circumstances surrounding the deaths of two of his lovers), and was kicked out of his position as the mayor of a small hamlet for bizarre behavior. He, his wife Georgette and his son relocated to Paris, where the doctor hung out his shingle and opened a private practice immediately. So many of the historical documents left behind from which we could learn about Petiot are confused and jumbled, and the man, as he proved at his final trial, was a pathological liar – so there’s still much left unanswered. For one thing, we don’t know when Petiot conceived of his dastardly idea to pose as a member of the French Resistance to offer hope to wealthy Jewish families and others wishing to escape Paris. Petiot’s would-be clients, of course, weren’t connected to an underground railroad, but systematically bilked for everything they had, killed and dumped into the lime pit Petiot had installed. The book's story begins when one of Petiot’s neighbors on the rue Le Sueur notices smoke streaming out of his upstairs windows – smoke that carries with it the stench of death. The police are called immediately, and from then on, we’re mostly following the Chief Inspector Massu as he dives into this ghastly scene of carnage of slaughter. The killer is identified very early on. After that, there are few mysteries remaining for King to hold our interest, including whether or not the wily killer will ever be caught; whether Petiot (as he claimed) was working with the French Resistance or collaborating with the Nazis; which high official was protecting Petiot from behind the scenes. The author appears especially interested in the methods Petiot used to dispatch his victims. It’s a singular detail of Petiot’s deeds that, out of all the corpses and human remains pulled out of his basement, none showed any outward clues to how they died. No bullet holes or wounds, no broken bones that would suggest a blunt instrument. Even the room they were killed in showed no signs of struggle. Was it poison? King has a different idea -- one that, in light of what was happening at the time in camps like Auschwitz, is far more chilling. Unfortunately, King's examination of this mystery leads to his books most glaring flaw. The writer explains: “My doubts about the death by injection grew over the years, but increased most of all when I had the good fortune of unearthing a rare source about Marcel Petiot, published in Belgium in March 1944, only a couple of weeks after the discovery of the remains at rue Le Sueur.” This book contains the eyewitness testimony of one Raphaël K., the one person who could supposedly reconstruct Petiot’s system of dispatching his victims. Raphaël claimed to have come close to becoming one of Petiot’s victims, narrowly escaping with his life. After going through the screening process and agreeing to pay Petiot to help him escape Paris, he accompanies the killer to rue Le Sueur. After being poisoned, Raphaël wakes up in pain, his wrists and ankles locked in iron bolts hanging from the ceiling. As he takes stock of his situation, the room is suddenly overtaken with what Raphaël describes as “a stinking atmosphere.” A gas, King concludes, had entered the room. He goes on to speculate about what the gas could have been and then – without warning – the book ends with poor old Raphaël still hanging from the metal hooks, the room filling up with a presumably poisonous gas. If you’re like me, you’ll find it difficult to read this intriguing account without wondering what happened to the kid? How did he escape to tell his story? You’ll be frantically flipping through the end of the book, wondering if it’s missing a few pages. But no – the reader’s fate, it turns out, mirrors poor Raphaël’s – we’re left hanging. Death should please anyone who enjoys a good true crime book – particularly books set in historical times. King keeps things interesting with enlightening details about the Occupation and eventual liberation of Paris. He also keeps an eye on some of the city’s most famous residents during of the time, though they barely intersect with the main story: we spend time with Jean-Paul Sartre, Albert Camus, Pablo Picasso and other luminaries who kept Paris’ reputation as the place for artists alive even as jackbooted thugs roamed the streets spreading fear and violence. Those strengths are more than enough to paper over the few flaws, making Death in the City of Light a strong contender for best true-crime title of the year. 8 Responses to "Murder and Monsters a la Francaise"
Two great reviews... I'll definitely be adding Monsters of Gévaudan to my ever-growing list. This is my first I've ever heard of the incident (not really surprising... my French history is a bit spotty) - so can you also recommend supplementary reading? Maybe something a little more narrative? I'm less sure about Death in the City of Light. I don't know if we've discussed Devil in the White City? I never understood its popularity - I found the whole thing too speculative for my taste. I think I would have respected the author more if at some point he'd realized his research was unable to fill in the details he needed and written a novel "based on the events of...". Is Death in the City of Light more substantive? And, while I'm here - I've loved your coverage of (and response to) Occupy Wall Street! Thanks so much for taking the time to inform. Thanks for the positive feedback, Tara. But, just to be clear, the talented Mr. Garrett Kenyon of Kansas City, Missouri gets credit for this article, not me! He's our regular Litkicks mystery reviewer. I will take credit for the Occupy articles, though. Nice article. I've heard of both books but read neither (yet). Never would've thought about how many similarities the two incidents shared. Hats off! I'm reminded of the German serial killer Fritz Haarmann, known as the "Vampire of Hanover," who was executed in 1925. I'm sorry, but I can't recommend any others. Everything I knew about La Bete before reading Smith's book was from articles online. And, surprisingly, there's even a dearth of good sources there. If you check on Amazon, though, you'll find dozens of translated books about her -- read the customer feedbacks and choose wisely. if you find a good one, please do let me know. My email address is: garrettkenyon@yahoo.com. Thank you for insightful reviews of those books. Regarding Raphaël K. person in "Death in the City of Light", author does (if rather briefly and obscured) explain his escape in the footnotes at the end of the book. Be sure to check. For what happened to Raphael k, check the footnote on page 400.